A “cryptocurrency” is a peer-to-peer, decentralized, digital currency. In 2009, Bitcoin became the first cryptocurrency to trade on third-party markets. Since then, many cryptocurrencies have been developed and are actively traded. Cryptocurrencies offer the potential for merchants to one day break the stranglehold of credit card processing fees. Cryptocurrencies are a disruptive technology that should be actively followed and considered. After all, online commerce is itself a disruptive technology. Here are the top ten cryptocurrencies, ranked by their current market caps at the time of writing this list according to CoinMarketCap.com. Bitcoin is the first implementation of a cryptocurrency, which was first described in 1998 by Wei Dai and specified by Satoshi Nakamoto in 2009, establishing a decentralized form of money that uses cryptography to control its creation and transactions. New Bitcoins are generated by a competitive and decentralized process called “mining,” the process of spending computing power to process transactions, secure the network, and keep everyone in the system synchronized together. The number of new Bitcoins created each year is automatically halved over time until Bitcoin issuance halts completely with a total of 21 million Bitcoins in existence. Bitcoin’s high cryptographic security allows it to process transactions in a very efficient and inexpensive way. 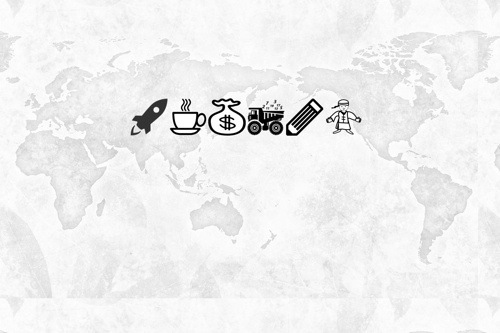 You can make and receive payments using the Bitcoin network with little or no fees, and without a merchant account. Payments are made from a wallet application, either on your computer or smartphone, by entering the recipient’s address, the payment amount, and pressing send. To make it easier to enter a recipient’s address, many wallets can obtain the address by scanning a QR code or touching two phones together with NFC technology. Market Cap: $10.6 billion (12.1 million coins). Merchant guides. Here are two guides to help merchants learn how to accept Bitcoins for payment: Bitcoin Merchant Howto, How to accept Bitcoin, for small businesses. Bitcoin Payflow. This site provides an API to automate Bitcoin processing and to track order payments. Bitcoin shopping cart interfaces. This is a list of plugins to add Bitcoin to your shopping cart. It includes WordPress, Magento, Zen Cart, PrestaShop, and more. Litecoin is based on the Bitcoin protocol, but differs from Bitcoin in that it can be efficiently mined with consumer-grade hardware. Litecoin provides faster transaction confirmations and uses a mining proof-of-work algorithm to target the regular computers with GPUs — graphics processing unite — most people already have. Litecoin provides a mining algorithm that can run at the same time on the same hardware used to mine Bitcoins. 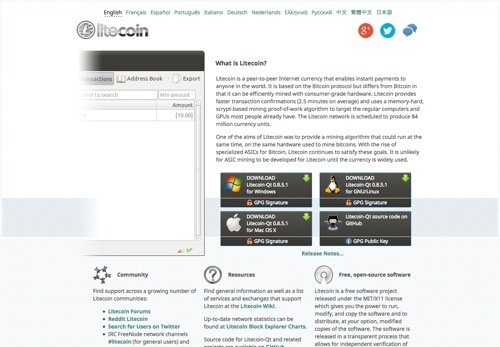 The Litecoin network is scheduled to produce 84 million currency units. Market Cap: $731 million (23.9 million coins). Litecoin Wiki. This directory is intended for the listing of any Litecoin-related services, including, exchanges, digital wallets, merchants, and merchant tools for payment processing. LitecoinTalk.org. Here is the official Litecoin forum to meet with developers, merchants, and speculators. Peercoin is a cryptocurrency project forked from Bitcoin that strives to achieve energy efficiency and increased security. Like other cryptocurrencies, initial coins are mined through the more commonly used proof-of-work hashing process. However, unlike other coins, as the hashing difficulty increases over time, users continue to be rewarded with coins generated by the additional proof-of-stake algorithm. Unlike most cryptocurrencies, Peercoin does not have a fixed money supply. Market Cap: $90.1 million (20.9 million coins). 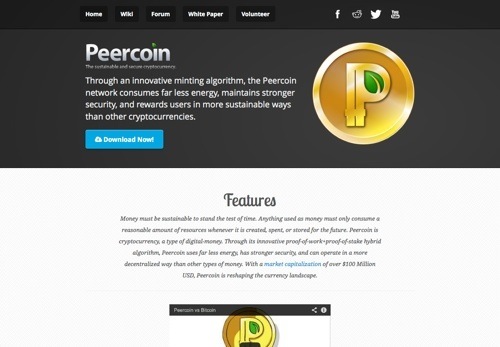 Peercoin wiki. This is the official Peercoin wiki and provides a list of services, FAQ, and a history of cryptocurrency. Quark is a cryptocurrency that focuses on enhanced security, using nine separate rounds of encryption and six different algorithms. Quark is mined by CPU only, with 247 million mined in the first six month and then an additional 1 million units mined every year. Quark coin will continue to release coins in perpetuity at an inflation rate of .5% per year. Market Cap: $47.4 million (246.3 million coins). Quarkcoin.cc. 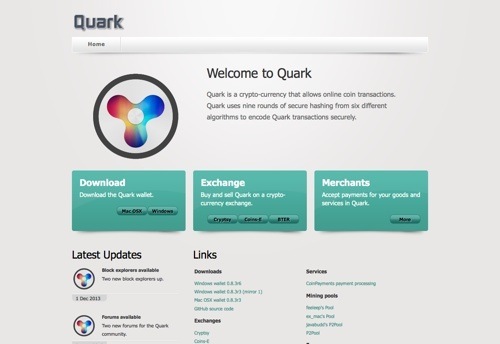 This is the official Quark cryptocurrency blog. It links to a beginner’s guide, a digital wallet, mining pools, exchanges, forums and more. Namecoin DNS and DotBIT Project. Namecoin is based on the Bitcoin source code. A cryptocurrency, Namecoin also acts as a DNS, a decentralize domain name system to buy, register, configure, and sell domains. 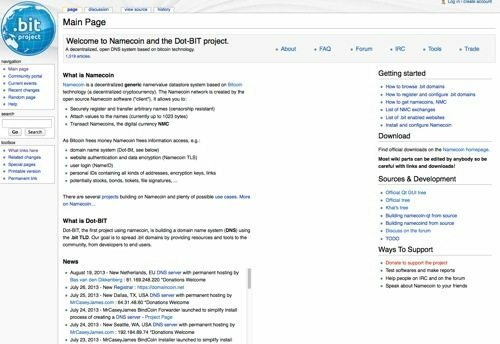 The first project using Namecoin is the .bit domain. Market Cap: $44.4 million (7.4 million coins). Namecoin Tools. This page lists tools and services for Namecoin, including domain search, domain cost, and a .bit registry. ProtoShares are used to mine Distribute Autonomous Corporation (DAC) backed cyrptocurrencies while they are still in development by Invictus Innovations. DACs are essentially automated businesses that perform services. And so ProtoShares are stakes in future cryptocurrency platforms. Cryptocurrencies under development are BitShares for asset trading and DomainShares for domain services. Protoshares will achieve a maximum supply of approximately 2 million coins in 2 years. BitShares money supply will be about 20 million coins. Market Cap: $23.1 million (1.1 million coins). 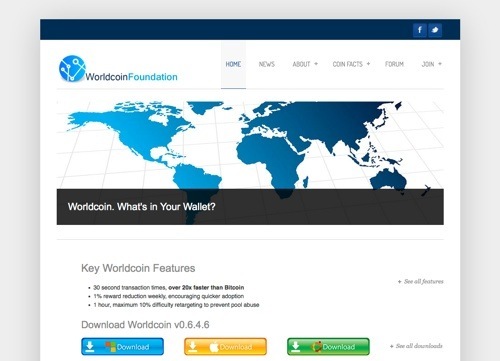 Worldcoin seeks to become the cryptocurrency of choice for merchants and consumers for their everyday transactions. Transactions are fully confirmed in about 60 seconds. Due to frequent block generation (30 seconds), the network supports more transactions without a need to modify the software in the future. At mining completion, 265 million coins will be produced. Market Cap: $20.6 million (35.2 million coins). Megacoin raises the most red flags among this list of cryptocurrencies. Launched just six months ago, fifty percent of the total coins have been mined. Upon mining completion, only 42 million coins will exist. Its branding might lead an investor to believe it is associated with billionaire Kim Dotcom’s Mega.co.nz, but there is no connection. If you are interested in monitoring the fate of the more speculative cryptocurrencies, this is one to watch. Market Cap: $15.3 million (21.2 million coins). Primecoin is the first cryptocurrency with non-hashcash proof-of-work. Primecoin’s proof-of-work is based on searching for prime number chains, providing potential scientific value in addition to minting and security for the network. 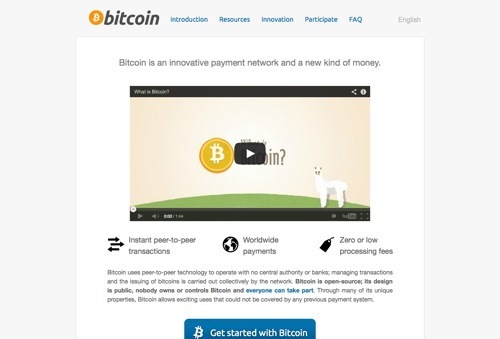 Similar to Bitcoin, Primecoin enables instant payments to anyone, anywhere in the world. It also uses peer-to-peer technology to operate with no central authority. Primecoin is also the name of the open source software that enables the use of this currency. Market Cap: $13.8 million (3.5 million coins). Primecoin wiki. This is the official Primecoin wiki and provides notes on installation and mining, a list of services on the market, FAQ, and updates. Feathercoin is based on Litecoin’s Scrypt-based hashing algorithm for GPU mining, rather than requiring Bitcoin’s expensive ASIC mining hardware. Feathercoin uses advanced checkpointing to provide additional security through a form of centralization without having to redistribute the Feathercoin software. At mining completion, 336 million coins will be produced. Market Cap: $11 million (26.2 million coins).